I recently came across advertising for a Rio Ridge Cycle Bag (I call it a pocket pack because you carry it in your jersey pocket) which intrigued me. I have certain objections to seat bags. I want mine small. I don’t like bigger ones that bulge, bounce around or rub on my inner thighs. I also don’t like seat bags with straps that wrap around my seat post. I find them unattractive and they rub and eventually mar the seat post. So the pocket pack intrigued me. So I contacted Rio Ridge and obtained one of these pocket packs. Measuring 6″x4″x1″ and made with water resistant neoprene padded for shock protection, it zips around three sides and folds open when unzipped. On either side is a mesh pocket, one with a zipper and the other with an elastic across the top. What you store in the pocket pack goes into these pockets. It also has a clip to which you can attach a set of keys. I immediately transferred a spare inner tube, patch kit, tire levers, two CO2 cartidges and inflator from my seat bag to the pocket pack and eliminated my seat bag. I also keep my minimalist wallet (driver’s license, credit cards and cash) in the pocket pack. Arranged correctly, the pocket pack still has a relatively narrow profile. Now, when I leave for a ride, I throw the pocket pack into my center jersey pocket (where it fits perfectly), my phone in the left pocket and whatever else I may be taking (energy bars, iPod, etc.) in the right pocket and I am out the door. Two upgrades would improve the pocket pack. First, have one of the mesh pockets divided into two parts. 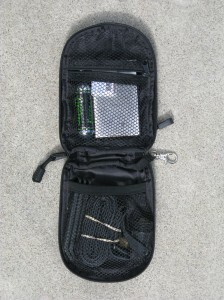 This would help keep tire levers, CO2 cartridges, patch kits and inflator in place. Second, put a zipper on both pockets. When the pocket pack is opened, the items in the pocket without the zipper start to fall out. I like the Rio Ridge Cycle Bag. It keeps my essential items for a ride neatly stored and easily accessible and it fits neatly in my jersey pocket. Category 4/HC rating: Category 2. With the suggested improvements, it would be a category 1. 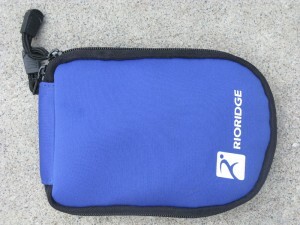 3 Responses to "Rio Ridge Pocket Pack"
Anybody tell me how to get one of these Rio Ridge bags??? I don’t believe this caught on and is no longer available. I have googled it, but cam up with nothing, nor do I still have any of the communication I had with the people who made this. Too bad, as I love mine and still use it after all these years.